Description We create you own Small-Business Global Internet LAN that provides instantaneous connectivity to your cloud computing applications, social networks, and Internet-based websites and Email systems. H/W Components One or more broadband speed links with TIMC-compliant DSL/cable modems supplied by customer. TIMC Monitoring ISP, CSPs, social network providers, and web/Email servers are monitored continuously using E2ERA. TIMC Remote Management DSL/cable modems, ISPs and TIMC Web Clients. 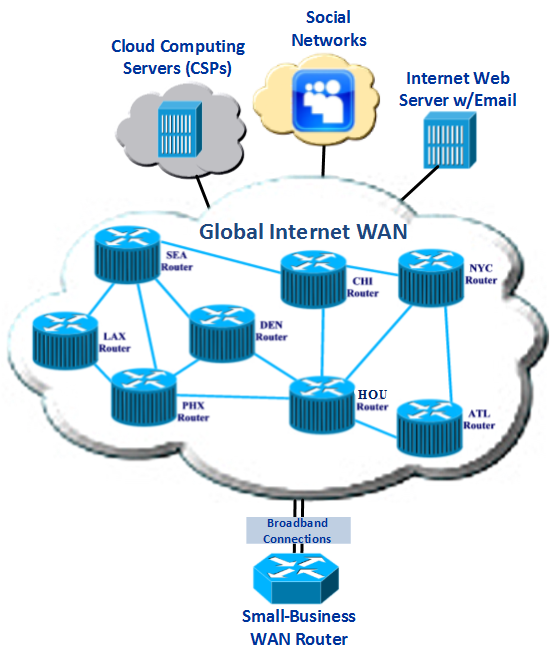 Performance Reports Global Internet WAN availability reports are created weekly, quarterly, annually, and on-demand. Problem Reports Copies of all open TIMC-created trouble-tickets are sent to customers daily. Closed trouble-tickets are sent to customer as soon as problem is resolved. Archived Statistics and Problem Reports All performance statistics and problem reports are archived on SQL database and are available online at any time. Most small-business owners have a conceptual view of the Internet as being a single, ubiquitous network that is managed by their Internet Service Provider (ISP). 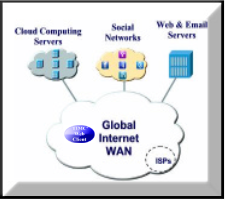 In fact, in most instances, "the Internet" is shown as a simple cloud, such as the one shown in figure 1. Unfortunately, nothing could be further from the truth! The Internet is in reality, the most complex packet-switching network in the world. It is a network composed of tens of thousands of other, smaller networks. These smaller networks are owned and managed by dozens of Tier One, Tier Two, and Tier Three ISPs. Figure 2 (though greatly simplified) is a much more accurate depiction of the "network of 1000s networks" that comprise the global Internet. The new Internet Protocol version Six (IPv6) will provide address-space for the "Internet of the Future" which could conceivably be millions of times the size of today's Internet. The Small-Business Global Internet WAN we create for your business is composed of the same Internet connections that are used to interconnect general Internet users to Internet service providers. The only differences between these two Internet types, is that we monitor your Global Internet WAN connections on continuous. 24/7 basis. This monitoring not only occurs at end-points but all the intermediate routers in the end-to-end path. 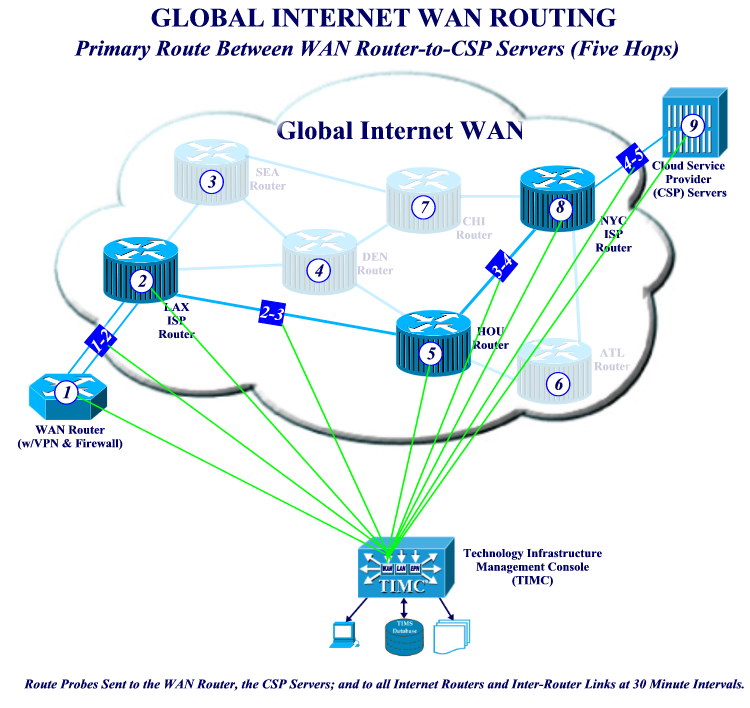 Each connection in your Global Internet WAN has from eight to fifteen intermediate routers (also referred to as hops), and the current operational status of each router is requested by the TIMC on a frequent basis. This operational status is requested by sending frequent Route Probes to end-points and all intermediate routers two times each hour. The responses of these Route Probes are analyzed and stored on disk, for future processing. These results are also used to create graphic displays that illustrate the speed, performance, and availability of all routers in the specified path. WAN connections interconnect your enterprise LAN to your business applications and databases located on servers own by your CSPs, SNSP, and WSPs. If you would like to hear more about our Technology Infrastructure Management Services (TIMS); and how they can help make your small business more efficient, productive, and more profitable, please call (623) 979-1827 or (602) 278-4778.